Mormon Station was built in 1851 as a trading post along the Carson Route of the California Trail. With the discovery of gold in 1848, thousands upon thousands of emigrants starting making their way through present day Nevada along the California Trail. With the last stop for supplies along the California trail being in Salt Lake City, more than 500 miles away, a trading post was desperately needed to supply travelers before they crossed the Sierra Nevada Mountains. A previous “Mormon Station” had been strung together by Abner Blackburn and Hampton Beatie the year before. They constructed, along with five other men, a shelter of just four log walls during the late spring of 1850. This structure did not have a floor or a roof, as it did not rain that summer. During this time, supplies were sold at high prices and Beatie accumulated more than 100 horses from the traveling emigrants. Beatie sold the incomplete trading post and traveled back to Salt Lake City in September of 1850. On the trip back, somewhere on the Humboldt River, Beatie’s party was attacked by Native Americans and all horses and supplies were lost. Upon returning to Salt Lake, Beatie took a job at a store owned by John Reese. After hearing about Beatie’s western adventure and a possible lucrative business opportunity, John Reese decided to move out to the Carson Valley the following spring of 1851. John Reese arrived in the Carson Valley at the site of Beatie’s old trading post on July 4, 1851. He made sure to purchase the site, which now belonged to a Mr. Moore, for a sum reported to be between $15 and $20. The remaining property was secured from Captain Jim of the Washoe Tribe for two sacks of flour. Reese then fenced and plowed 30 acres for seed and built a combination store and hotel out of logs. Once the hotel and trading post began operation, a blacksmith shop was also built to repair emigrant wagons. Prices at the trading post were high, as the emigrants were so desperate for supplies that they were willing to trade or buy supplies at high prices. As an example, John Reese sold turnips at the unheard of price of $1 per bunch. As more people began to settle in the area now referred to as “Mormon Station,” Reese organized a squatter’s government that did not follow the same laws as the Utah Territory in which Mormon Station was then located. This prompted the Utah Territorial Legislature to organize Carson County, Utah in 1854. Governor Brigham Young appointed Mormon Apostle Orson Hyde to serve as probate judge and spiritual head of the community. Orson Hyde changed the name of the community to Genoa (after Genoa, Italy) and made it the county seat. Mormon pioneers settled in the area until 1857 when Brigham Young called all Mormons back to defend Salt Lake from the advancing U.S. Army. Genoa was a regular stop for the Pony Express during its 18-month heyday from 1860-1861. In 1861 Congress created the Territory of Nevada. James Nye assumed his duties as Governor and designated Carson City as the capital of the new territory. Three years later, on October 31, 1864, Nevada became the thirty-sixth state in the Union. 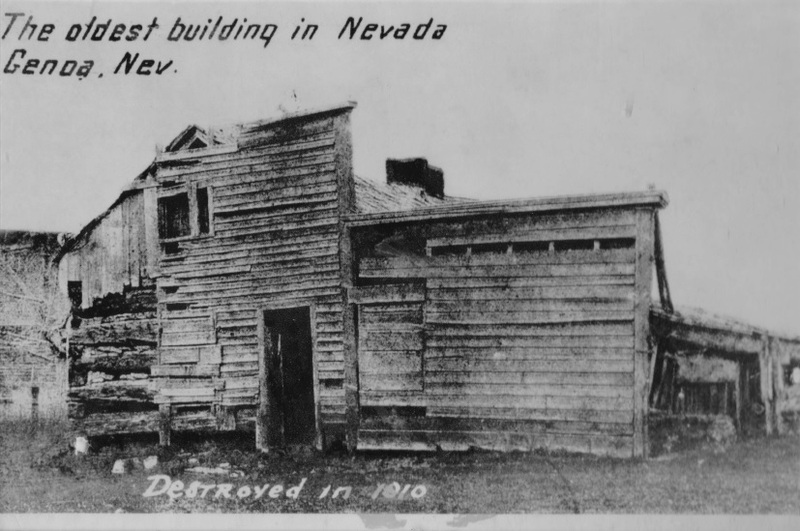 Because statehood occurred during the Civil War, Nevada became known as the "Battle Born" state. As the Comstock silver and gold discoveries continued, Genoa remained an important center of activity for freight and passenger traffic. The route of commerce permanently shifted when the Central Pacific Railroad was built and the county seat was moved from Genoa to Minden in 1916. Today Genoa offers visitors a quaint small town experience that includes a rich history, two museums, delicious food choices, lodging, gift and antique stores, a variety of recreation opportunities, wildlife viewing and more. Mormon Station State Park is home to a reconstructed version of the original 1851 Mormon Station trading post that burned down in 1910. Rebuilt in 1947 as a museum, today it houses many original pioneer era artifacts.